The Voice of America's studio 55. VOA photo. The Voice of America may finally be coming to America. Legal changes going into effect this month mean that, for the first time, U.S. audiences can access the news and information programs produced by the Broadcasting Board of Governors – the independent agency that manages U.S. international broadcasting operations. The change has brought with it a remarkable amount of handwringing about the ability of the U.S. government to supposedly inundate Americans with propaganda. However, those concerns have little grounding in reality. In fact, the changes at the Broadcasting Board of Governors are a positive step in government transparency and could provide new voices and viewpoints for American audiences. "For many in the U.S., BBG content is the only place in America they can hear news coverage of their homelands, in their native language." 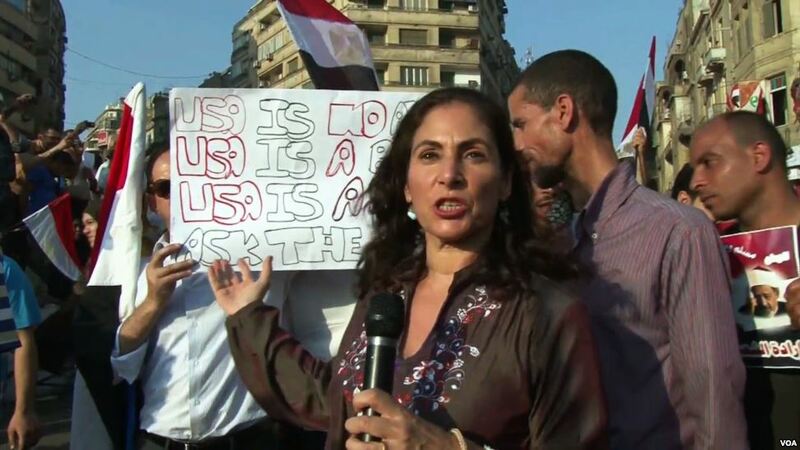 VOA correspondent Sharon Behn reporting Sunday, July 7 from Tahrir Square in Cairo, where protesters gathered to celebrate what they call the “Second Revolution” – the military’s ouster of President Mohamed Morsi. VOA photo. To be clear, there are real concerns about government propaganda, but those concerns are misplaced on the BBG. When the U.S. government seeks to sway popular opinion in the U.S. it has consistently turned to commercial media, not public media. See for example the Bush administration’s promotion of No Child Left Behind and the war on terror. In both cases, commercial media continued to air the government’s propaganda even after it has been exposed. Up until this month, however, few in the U.S. knew what those programs sounded like. Americans could access the content online, but doing so was officially illegal. The changes that go into effect this month permit, but do not require, the BBG to make their content available domestically. There are no new BBG stations being built to transmit the content and no government-run cable channel in the works. All this does is make the content accessible to citizens and stations who want them. And that’s a good thing. The budget for the BBG is roughly twice that of the Corporation for Public Broadcasting (which is still just peanuts). Given that investment, Americans should be able to watch and listen to it, assess it and judge it. At the American Civil Liberties Union, Gabe Rottman outlines why these changes are not just good for transparency but also for freedom of speech. “From a First Amendment perspective,” he writes, “the ban is both highly paternalistic and a nightmare for government transparency.” The ban has meant that up to this point BBG-produced material has even been exempt from the Freedom of Information Act. The Voice of America building. VOA photo. The BBG isn’t the only federal agency to produce media and journalistic content. NASA has invested heavily in its media operations, from iPhone apps to celebrated video channels and more. The National Science Foundation funds a newspaper in Antarctica — The Antarctic Sun. Even the Consumer Financial Protection Bureau has created interactive tools not much different from data journalism projects produced down the road at the Washington Post. Even the BBG, which still broadcasts on shortwave radios in many parts of the world, has funded some groundbreaking work on digital innovation and online storytelling. In reality, America’s public and noncommercial media sector has long encompassed more than just those national brands and is growing more diverse and multifaceted every year. To understand the whole picture, we have to view public media as a network of noncommercial and nonprofit institutions that share a similar mission: serving diverse, local communities by providing alternatives and filling the notable gaps left by commercial media. We proposed a new framework for thinking about public media in America that better weaves together the diverse organizations and agencies engaged in meeting the information needs of our communities. In the case of the BBG and the changes taking effect this month, the gaps in commercial media’s coverage of international affairs are notable. While commercial media in the U.S. has been closing foreign bureaus the BBG has been putting more journalists on the ground around the world and broadcasting in more languages than any broadcaster in the U.S. For many in the U.S., BBG content is the only place in America they can hear news coverage of their homelands, in their native language. At its best, all these changes could bring diverse new voices and viewpoints to U.S. media. The BBG could be serve as an R&D lab, pushing new digital ideas and projects for a global audience that media here in the U.S. can learn from. The shape of international news is changing dramatically, and we should assess each of these new entrants carefully. But we should apply the same skepticism to our commercial media, which has too often been partners in propaganda themselves. Correction: This article originally stated the BBG was funded through the State Department. It has been updated to clarify that the BBG is an independent agency. The idea of trusting government officials with news management and news distribution is ludicrous, especially when it comes to domestic news, but even foreign news for foreign audiences can be at risk in the hands of bad government managers. When their own journalists dared to criticize them, these officials were often brutal, as the employee union, AFGE Local 1812, has extensively documented various forms of management retaliation on its website. There have been vicious attacks by Voice of America (VOA) officials on independent American journalists who annoyed them or wrote critical articles in U.S. media. Google Matthew Russell Lee and VOA to see what these managers are capable of. Mr. Stearns’ faith in them is astounding. They have been rated in the Office of Personnel Management (OPM) Federal Employee Viewpoint Survey (FEVS) as being the worst managers in the federal government. While officials currently in charge are not a very nice group of people, no government official ever can be trusted in the role of distributing news in the United States. The idea of giving this group the power to target specific groups of Americans with news, is simply frightening. Former Secretary of State Hillary Clinton said that their efforts to win the information was abroad were “defunct.” No wonder that they wanted to look for a new audience. One example is especially telling. To justify their demand for lifting the domestic propaganda ban, they often referred to a reported request from a Somali-language radio station in Minnesota to rebroadcast VOA Somali programs. The old law would not allow these officials to provide the program, but the Somali station could have easily downloaded it off the Internet, where it has been available to anyone, and legally used it. Officials still repeat the same story. At one point, one official admitted that he did not really know whether the Somali station in Minnesota had gotten the program on its own from the Internet or not. His statement showed that he really did not care what happened. What he cared about is for Congress to give him and other government bureaucrats additional powers to distribute news programs directly to Americans without any restrictions. It was not illegal before the law was changed for anybody in America to rebroadcast these programs on AM and FM radio or TV if they obtained them on their own from the Internet or from satellite. The Somali example is still being used by these officials despite its nasty element of ethnic profiling. They came up with it to scare lawmakers and American public into giving them additional powers. Various other minority groups in America have a good reason to worry that they might become the next victim of such ethnic, racial or religious profiling and targeting. The ultimate tragedy is that this controversy is terrible for U.S. domestic support for Voice of America, Radio Free Europe/Radio Liberty (RFE/RL), Radio Free Asia (RFA) and other U.S. government-funded media entities that serve overseas audiences that truly need such such news programs. It unjustly undermines their good reputation and exposes them to domestic partisan disputes in America. These media entities still produce some excellent news programs to countries without free media despite remarkably bad central management in Washington. They still employ some excellent journalists, although many have been laid off. All of their programs should have been placed in the public domain long time ago and anybody in the United States should have been able to use them if they choose to. In fact, VOA and Radio and TV Marti programs were already in the public domain. Putting all RFE/RL, Radio Free Asia (RFA), Radio Sawa and Alhurra TV programs in the public domain would have solved the problem of usage without causing a major domestic political controversy. But U.S. government officials also wanted the extra power of distributing these programs to Americans. In the process, they have undermined public support in America for the important overseas mission of these media entities. There is little doubt that with these new powers they will divert resources from serving foreign audiences to satisfy their ambition to expand into the domestic U.S. media market. If U.S media outlets were truly interested in using VOA, RFE/RL or similar content, they could have done it before the law changed. Officials will find it necessary to launch marketing campaigns and to target specific stations and networks. From the trial transcript of printer John Peter Zenger in 1735, to the the 1776 Virginia Declaration of Rights, holding that “the freedom of the press is one of the greatest bulwarks of liberty and can never be restrained but by despotic governments,” and the 1791 First Amendment to the United States Constitution (The Bill of Rights), stating that “Congress shall make no law respecting an establishment of religion, or prohibiting the free exercise thereof; or abridging the freedom of speech, or of the press; or the right of the people peaceably to assemble, and to petition the Government for a redress of grievances” — freedom of the press was always defined as freedom of “free press” from government interference. Free press was free because it was free to criticize the government. Authors of these documents would consider the term “free government press” as an oxymoron. The government has always had abundant powers to communicate its own news and its own message. Free press exists to protect citizens from too much government power, including the government’s power to issue government news and information. The Smith-Mundt Modernization Act of 2012 has in effect established government press in the United States by giving government officials explicit powers to deliver political and other news to Americans, but mainly political news. At least broadcasting to foreign audiences, which serves important U.S. national security and humanitarian interests, does not raise constitutional questions of free press versus government press in the United States or fears of specific groups of Americans or all Americans being targeted with government propaganda. Government press is not part of the American constitutional tradition and should have no role in American life. The risks to free press and other civil liberties do not justify any of the dubious benefits that the change in the old Smith-Mundt anti-propaganda law might have offered. The freedom of the press can never be restrained but by governments with despotic tendencies. All governments have them. Putting government officials or private bureaucrats drawing 100% of their salaries from the government in charge of news distribution in America and calling it free press is a dangerous and ludicrous idea. Your article states “While commercial media in the U.S. has been closing foreign bureaus the BBG has been putting more journalists on the ground around the world”. Although this is what those in charge of U.S. international broadcasting would like people to think, it is not the whole story, particularly regarding the Voice of America, whose respected global network of bureaus and staff correspondents has been hacked back significantly in recent years – despite overall funding for the BBG having increased since 9/11. 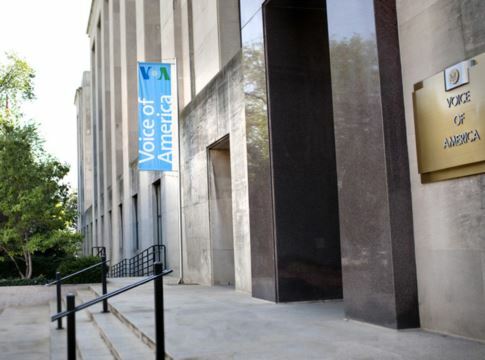 For example, in the 1980s and early 1990s, VOA had bureaus and English language staff correspondents in Mexico City, San Jose (Costa Rica), and Rio de Janeiro. As a listener in the UK – obviously a media rich country with a free press – I still found VOA worth listening to because their correspondent network in Latin America was more extensive than any UK newspapers or broadcasters, with the sole exception of the BBC. (And for the record, the VOA reporters always reported the news completely straight). Today, in contrast, VOA doesn’t have any English language staff correspondents permanently based in Latin America at all – not one – so VOA now has poorer coverage of Latin America than the big U.S. newspapers. 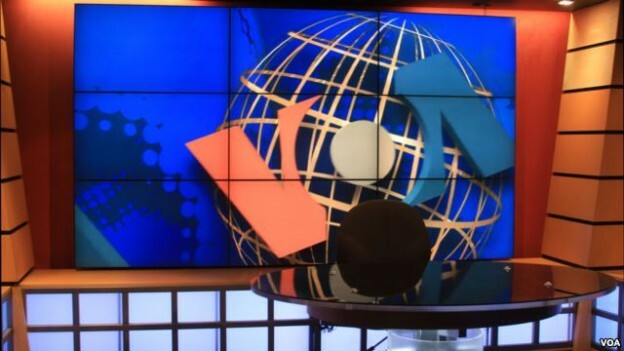 Recent years have seen a similar slashing of VOA bureaus in Europe, and a significant cutback in Asia too – so I would question one of the central points made in this interesting article (although I very much agree with the “not propaganda” angle). The BBG’s 2014 Budget proposal – available on their website http://www.bbg.gov – goes even further in slashing the number of VOA journalists in Washington, and in bureaus abroad – please have a read of it yourself. Snippets include: (page 34): “Close VOA New Delhi bureau” – eliminates three positions; (page 35) “eliminate three VOA overseas correspondent positions at the news bureaus in Beijing, Jerusalem and Moscow” (my comment: hardly non news-worthy cities); and most damaging of all (page 32): “Reorganise VOA Central News & English Divisions – thirty-five positions will be decreased in the News and English Divisions under this proposal” (note “reorganise” seems to be a code-word for “slash”). This is hardly “putting more journalists on the ground”. The level of cuts to VOA Central News must surely raise questions as to VOA’s continuing ability to cover the news effectively – and its increasingly poor website (VOAnews.com – check out how much is Reuters copy) suggests it’s already struggling – although there is more original reporting on the radio service (although far less than there was a decade and more ago). News coverage of the Smith-Mundt changes so far has focused on one of two angles: (1) it is dangerous domestic dissemination of “govt propaganda”, or in contrast, (2) U.S. govt funded broadcasters provide better world news coverage than U.S. domestic media. I think there’s a third angle, which should be covered more than it has been: is U.S international broadcasting being run effectively? (And if it is, why are so many VOA and ex-VOA staff so concerned about the direction VOA is heading, as per Ted Lipien and Gary Thomas’s comments?) Related to this, how is the BBG getting away with axing news positions and closing overseas bureaus, whilst getting credit for “putting more journalists on the ground” and NOT closing overseas bureaus? Something’s not quite right here. Or VOA is another CIA-run “fake news” front.